This is Sharon Baugh’s second year as an artist for Art Bra Austin. She works in many mediums, but none of them are as applicable to the Art Bra Austin auction as her love of arts and crafts and costume design. Sharon is a breast cancer survivor. She was diagnosed with breast cancer when she had her first mammogram on her 40th birthday. Thanks to very early detection and frequent check-ups, Sharon has remained cancer free for over 25 years and counting. When she received her diagnosis, she said that there was nothing like The BCRC in the Dallas area to help guide her through the myriad of decisions and provide the kind of support that BCRC provides. Last year, her friend and Art Bra model veteran, Karen Gregg, recommended that she submit an art bra creation for BCRC’s silent auction. Sharon took up Karen’s advice and is very happy she did. She feels fortunate to be able to contribute to all the excellent work and services BCRC provides. The design of “Dancing with Survivors” was inspired by the costumes on the popular TV series, “Dancing with the Stars.” Sharon wanted to create an art bra that would celebrate of all the breast cancer survivors BCRC has helped over the years. Almost entirely hand-sewn, the bra piece is styled in the theme of 1920’s. It is intricately decorated with sparkling rhinestones and fringe. The fringe design is made up of light shades of pink and iridescent beading, reflecting the beauty and femininity of the art bra’s wearer. 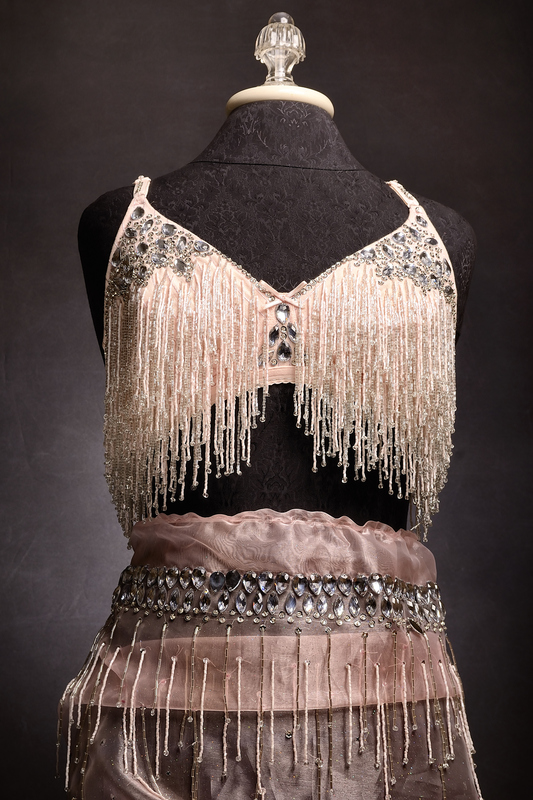 The art bra comes with a beautiful matching skirt to complete the 1920’s look! Beautiful! And to think that you did all that beading with arthritis in your hands makes it even more beautiful, Sharon!